We now meet at Fava’s Restaurant, 159 E. Main (Main & Hamilton), in Georgetown Kentucky – second Saturday of each month except December. Time is 10:00 A.M. Join us for a cup of coffee. Mike Gozia: 502-241-0337. Email: motogozi@yahoo.com. Warehouse Sports Bar and Grill, 1206 West South Street, Lebanon, Indiana meet at 1:00 P.M. first Sunday of every month. Brand X welcome. More information available contact: Indiana MGNOC Rep, Andy Thompson, 224 North Vine, Thorntown, Indiana 46047, 765-436-7150. Frankfort, Indiana, Sunday 1:00 P.M.
Home of David and Diana Dugger, 2302 Wilshire Drive, Frankfort, Indiana 46041. 765-652-0053. Everyone is invited. No need to bring anything. Just show up. The West Central Illinois Moto Guzzi Riders Inc. Sorry absolutely no pets allowed anyone who brings a pet will be asked to leave. Registration includes: rally cup, Friday night chili and brats, Saturday night smoked pork dinner, Continental breakfast Saturday and Sunday, 24 hour coffee and cold drinks, hot showers, two nights camping, no electrical hook-ups. ALSO included: wooded campsites, 50/50 drawing, door prizes. Location: 9 miles north of Oquawka, Illinois on the west side of the Great River Road at Big River State Forest. Accordance to the campground-no generators after 10:00 P.M. and before 7:00 A.M.
Price: $35 before May 1st, $40 after May 1st. $5 for children 12 and under. For pre-registration send rally fee to: E.G. Bowman, Box 231, Kirkwood, Illinois 61447. For information call: E.G. Bowman 309-371-7912 or John Hart 309-337-0190. Lake Joy Campground. All brands welcome. Registration is $40 before July 1, 2019, $50 at the gate. Sign up. We feature Wisconsin’s best grilled Klement’s brats and Weber burgers Friday evening, pulled pork, and beef Saturday evening and deluxe continental breakfasts on Saturday and Sunday mornings. As always, Wisconsin’s finest refreshments, including soft drinks, will flow from the artesian taps. The rally fee also includes tent camping Friday and Saturday. We also feature a 100± mile 100% cash payout scenic poker run, 50-50 drawing that has paid out enough for the winner to attend 10 rallies, and biker flicks with cheese snacks in the evenings. Lake Joy is located in the heart of Wisconsin’s “driftless” region – the area not flattened by the glacier. It is spectacularly scenic riding territory. The campground has clean modern restrooms and showers, and a 60 acre private lake (no fishing license required) with two beaches. Tune in here for late breaking developments. 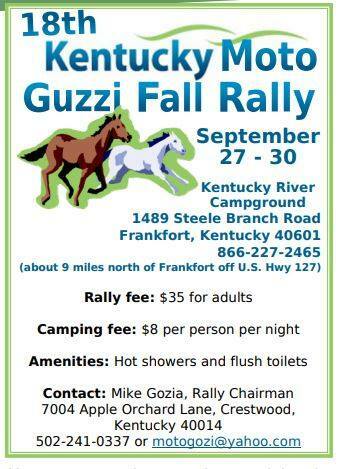 Note that the camping area reserved for the rally does not include electric or water hookups. If you require electricity for medical equipment, there is a limited amount of tent camping space in the vicinity of the restroom/shower building. Bring your earplugs! Those with camper trailers and RV’s who desire full hookups must contact Lake Joy Campground and make separate arrangements. 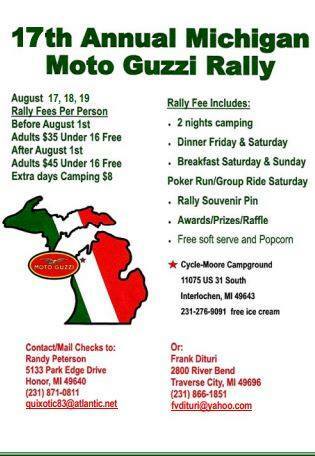 The Michigan Moto Guzzi Rally will again be held at the Cycle-Moore Campground in Interlochen, Michigan. Rally fee per person before August 1st: Adults $35, under 16 years old free; after August 1st, adults $45, under 16 years old free. Camping fee is $10 per day at the office. Poker Run / Group Ride on Saturday, rally souvenir pin, awards, prizes, raffle, free soft serve (ice cream) and popcorn. Place: Cycle-Moore Campground, 11075 U.S. 31 South, Interlochen, Michigan 49643. 231-276-9091. Contact/Mail checks to: MGNOC State Rep Randy Peterson, 5133 Park Edge Drive, Honor, Michigan 49640, 231-871-0811, quixotic83@atlantic.net. 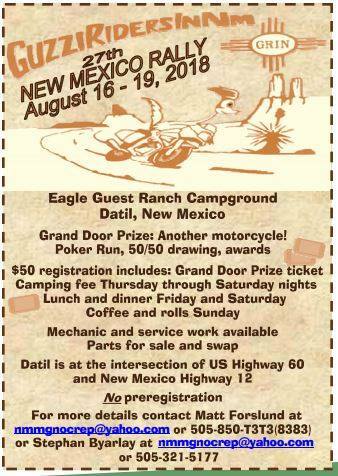 Eagle Guest Ranch Campground, Datil, New Mexico. Grand Door Prize: Another motorcycle! 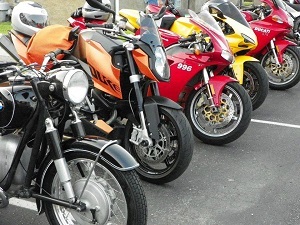 Poker Run, 50/50 drawing, awards. $50 registration includes: Grand Door Prize ticket, camping fee Thursday through Saturday nights, lunch and dinner Friday and Saturday, coffee and rolls Sunday. Mechanic and service work available. Parts for sale and swap. Datil is at the intersection of U.S. Highway 60 and New Mexico Highway 12. No preregistration. For more details contact Matt Forslund at nmmgnocrep@yahoo.com or 505-850-T3T3 (8383); or Stephan Byarlay at nmmgnocrep@yahoo.com or 505-321-5177.